This guide shows how to modify the content-based load balancing configuration to route requests for static content to a Cloud Storage bucket. After you configure a content-based load balancer with a Cloud Storage bucket, requests to URL paths that begin with /static are sent to the storage bucket, and all other requests are sent to virtual machine instances. If you are using the gcloud or gsutil utilities, you can install them both by referencing the Quickstart: Using the gsutil Tool document. a. Go to the Home page in the Google Cloud Platform Console. b. To the right of Google Cloud Platform, select a project from the pull-down menu. [PROJECT_ID] - the project you will use for this guide. Complete the guide for content-based load balancing. The instructions in this document require the resources you'll build using that guide. The following instructions assume you are uploading a single object to a Cloud Storage bucket and then setting permissions for the object. If you intend to make all objects in the Cloud Storage bucket public, use the instructions in Making groups of objects publicly readable. If you would like to use wildcards (globs) to upload and set permissions for multiple objects, see Wildcard Names. For more information on uploading objects, see Uploading Objects. 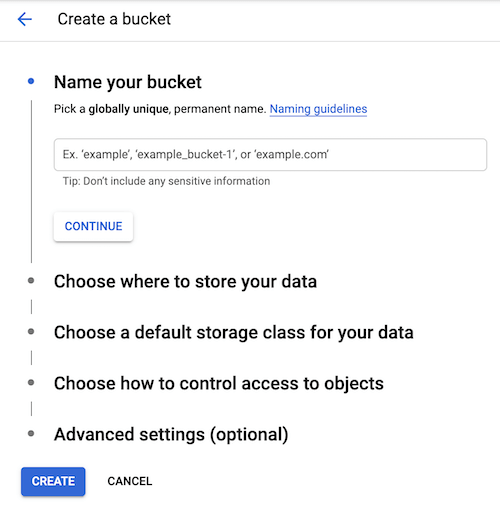 Create a Cloud Storage bucket and upload an object to it. Bucket names have to be globally unique. In this example, we create a regional bucket in the same region as the instances in the content-based load balancing example. Choose Multi-Regional for Storage class. Choose United States for Location. While in the bucket, click Create folder. Enter a folder name of static. Upload an object from your local directory. While in the folder, click Upload files. Browse to the object in your file system, then select it. Make the object publicly readable so it can be served through load balancing. The drop-down menu appears as three vertical dots to the far right of the object's row. Enter allUsers for the Name. Upload an object from your local directory. If the file is in another directory, provide the complete path. This procedure assumes that you have completed the content-based load balancing example. Instead of creating a backend service for static content as you did for video content, create a new backend bucket that points to the Cloud Storage bucket you created above. Click Edit in the web-map row. Click the right arrow next to Backend configuration. Click Create or select a backend bucket, then select Create a backend bucket. Enter a Name of static-bucket. Next to Cloud storage bucket, select Browse. Find and select the bucket you created before. Click Create to create the backend bucket. Do not click Update for the load balancer yet. Add a rule to your existing web-map URL map that maps /static/* to the backend bucket created above. This routes all requests that have /static/* to your Cloud Storage bucket. Click the right arrow next to Host and path rules. In the third row, enter * in the Hosts field. Enter /static/* in the Paths field. Enter static-bucket in the Backends field. Click Update for the load balancer. Go to the Addresses page in the Google Cloud Platform Console. Find the row for lb-ip-1 and make a note of the IP address in the External address field. Enter http://[IP_ADDRESS]/static/[OBJECT_NAME] or https://[IP_ADDRESS]/static/[OBJECT_NAME] in your browser, depending on which protocol your load balancer uses, and press Enter. The address you want is the address of the rule you created when you ran through the content-based load balancing example. Test that your Cloud Storage bucket is receiving traffic using curl or by visiting the URL in your browser. This command should respond with [OBJECT_NAME] from your [EXAMPLE_BUCKET] Cloud Storage bucket. If you store an object in the bucket with name of static/path/to/[OBJECT_NAME], you can retrieve it with a URL of http://[IP_ADDRESS]/static/path/to/[OBJECT_NAME]. Learn more about HTTP(S) load balancing. Improve performance with Cloud CDN edge caching. Use your load balancer with Google Cloud DNS.